It is now well-documented that a woman’s cumulative exposure to estrogen throughout her life is associated with her risk of breast cancer. Developed countries have and will continue to use estrogen medications such as oral contraception, hormone replacement therapy (HRT), bio-identical supplementation and medications to enhance fertility. Especially concerning is the current trend of an increasing incidence of estrogen receptor-positive breast cancers, with epidemiologists from the National Cancer Institute projecting a rise from 158 to 166 cases per 100,000 women in the U.S. by the year 2016. Many scientists have drawn attention to what is known as the dual carcinogenetic mechanism of estrogen. In addition to fueling estrogen receptor-positive breast cancers, estrogens enhance cell proliferation and acts as genotoxic precursors. Efforts have mapped single nucleotide polymorphisms (SNPs) in several estrogen metabolism genes that confer an increased risk of breast cancer. Breakthrough studies from Vanderbilt University, the University of Alberta, Harvard, and others, have found significant, synergistic interactions between specific groups of estrogen metabolism SNPs in association with breast cancer. These groups of SNPs simulate well-defined carcinogenetic mechanisms within the estrogen metabolism pathway. Importantly, these SNPs are not included in the traditional handful of familial breast cancer susceptibility genes such as BRCA1 and BRCA2. Familial genes account for less than 20% of breast cancers. The SNPs of interest occur in six estrogen metabolism genes. Interestingly, one SNP is not sufficient to increase the risk of breast cancer, but the interaction of two or more SNPs can increase breast cancer risk from 2.5 to as much as 13 fold. 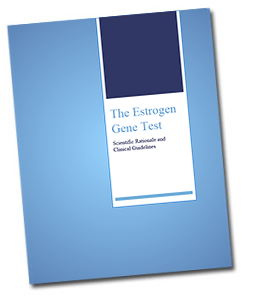 The Estrogen Gene Test is a simple saliva test that can be used to identify polymorphisms in all of the key estrogen metabolism genes. It is a unique tool that can identify patients who inappropriately metabolize estrogen and related compounds. While every woman should have an Estrogen Gene Test performed at some point, the test is particularly important in women who are considering oral contraceptives, hormone replacement therapy, bio-identical supplementation, in vitro fertilization, or who have been diagnosed with estrogen receptor-positive breast cancer. With this knowledge in hand, clinicians can mitigate breast cancer risk through targeted nutritional and lifestyle interventions.